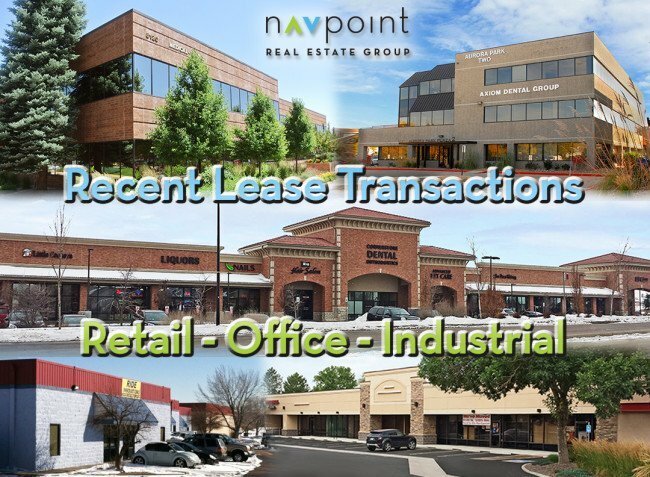 NavPoint Real Estate Group is pleased to release the details of our recent lease transactions throughout the Metro Denver Area. Rapid Restoration leased 12,050 SF of industrial/flex space at 6250 W 55th Ave in Arvada. Heather Taylor of Navpoint Real Estate Group represented the tenants and Steve Fletcher of Newmark Grubb Knight Frank represented the landlord. X Zone 51 executed a three year lease of 1,315 SF of retail space at 14000 E. Mississippi Avenue in Aurora. Heather Taylor of NavPoint Real Estate Group represented the tenant, and Tanner Johnson of AXIO represented the landlord. Success Real Estate Team leased 1,315 SF of office space at 6205 S. Main Street in the Southlands Shopping Center in Aurora. John Witt of NavPoint Real Estate Group represented the tenant, and Andrew Fox of David Hicks Lampert – Andrew Fox represented the landlord. Hijet Bit, LLC leased 4,900 SF of industrial/flex space at Havana Business Park located at 10500 Havana Ct., Unit C in Brighton. Heather Taylor of Navpoint Real Estate Group represented the tenant and Fran Schneider represented the landlord. The Meadows Neighborhood Company executed a three year lease of 1,995 SF of office space at 3740 Dacoro Lane Unit 145 in Castle Rock. Matt Call of NavPoint Real Estate Group represented the landlord. Colorado Farm Bureau Mutual Insurance Company leased 1,296 SF of offices space for seven years at 3740 Dacoro Lane Unit 150. Matt Call and John Witt of NavPoint Real Estate Group facilitated the transaction. The Piano Playhouse leased 690 SF of retail space for five years at 8100-8160 S. Quebec St., Suite B-201. Heather Taylor of NavPoint Real Estate Group represented the tenant, and Adam Rubenstein of Legand Retail Group represented the landlord. Primary Care Physicians DBA Dublin Medical Clinic leased 2,595 SF of retail space for three years at 2855 Dublin Blvd. Matt Call and John Witt of NavPoint Real Estate Group represented the landlord. Ramon Kelley renewed their retail lease at 579 Milwaukee Street in Denver, extending the lease for three years. This Cherry Creek retail center is located at the corner of 6th Ave and Milwaukee St. Heather Taylor and Matt Call of Navpoint Real Estate Group represented the landlord in this transaction. Thurston Inc., aka Thurston Kitchen and Bath renewed their retail lease at 2920 6th Ave in Denver. This Cherry Creek retail center is located at the corner of 6th Ave and Milwaukee St. Heather Taylor and Matt Call of Navpoint Real Estate Group represented the landlord in this transaction. T & S Automotive leased 2,976 SF of industrial/flex space at 11480 Cherokee St., Units D & E. Heather Taylor of Navpoint Real Estate Group represented the landlord in said transaction. A & S Contruction leased 1,488 SF of industrial/flex space at 11480 Cherokee St., Unit B. Heather Taylor of NavPoint Real Estate Group represented the landlord in said transaction. Antique Restoration Studio Group, LLC, a 40 year business specializing in Restoration of Antique Furniture leased 2,271 SF of Industrial Space for three years at Pacifica Industrial Park, 1865 W. Union Ave., Sheridan, CO. Matt Kulbe of NavPoint Real Estate Group represented the tenant. NavPoint Real Estate Group is a comprehensive Commercial Real Estate Services and Investment Firm with office locations in Denver, Castle Rock and Colorado Springs, Colorado. The company provides a wide array of services including Exclusive Brokerage Representation, Property/Asset Management, Consulting, and Investment throughout Colorado and the Western US covering all Commercial Property types. NavPoint brings an acute local market understanding combined with national reach and access to credit tenants and buyers to every client assignment. The firm is currently involved in the exclusive brokerage, ownership, or management or over 1,000,000 SF of commercial real estate covering all property types.